You might think January, with its biting cold, is not a great time toy buy even the best fan. But hey: when The Great UK Heatwave of 2019 is upon us, you'll find fans have all sold out. That’s why you need to buy the best fan NOW rather than leaving it late, and finding yourself wrestling a woman for the last remaining one in John Lewis. That’s undignified. Don't worry: as long as stocks last, these are the very best indoor fans and coolers you can buy. Although the average pedestal or desktop fan is only stirring the warm air it’s surrounded by, it does have a noticeable cooling effect on the body, especially if you’re a bit, er, sweaty. In fact you get an even better cooling effect if you dampen yourself with a wet towel first. And that brings us neatly to our choice of the best fans, the Dyson Pure Cool and MeacoFan 1056 Air Circulator. The former is a rather beautiful edifice that both fans and purifies. The latter is a brute of an air mover, that comes into its own when the temperature soars. It is SO powerful, and yet not terribly loud. A standard fan is probably the most simplified domestic appliance you’ll ever buy. After all, there’s no rocket science behind the process of a blade spinning around to stir the air and pushing the resultant breeze in your general direction. That said, not all fans are quite the same. You can snap up a cheap pedestal fan at Sainsbury’s that does the job perfectly well or opt for a retro-style one like the little desktop Swan reviewed below. Or you could splash out a bit more and get yourself an oscillating tower fan like the Bionaire BT19. Or, for a little more class, a handsome bladeless Dyson Cool Desk fan. For our money, though, nothing cools the body quite like a water-based air cooler. These appliances are cheaper than portable air-con systems and are a lot more energy efficient. 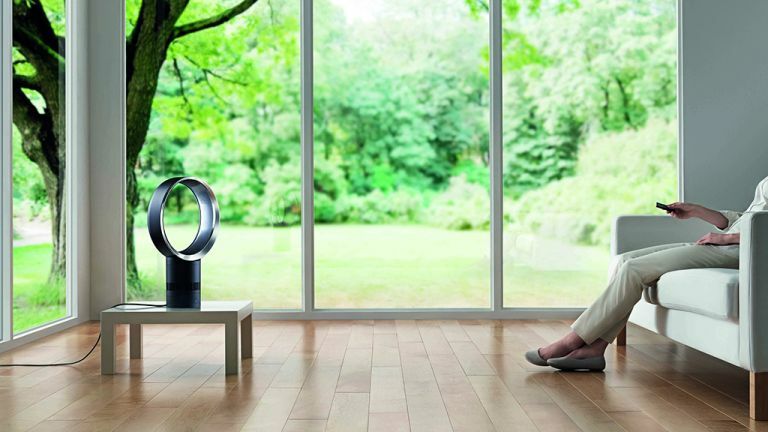 This typically elegant floor-standing fan from Dyson has an additional trick up your sleeve, as it is also an effective air purifier – we also have a list of the best air purifiers, of course. You might think this is too attractive to effectively clean your air (most such devices are squat rectangles with buttons on top) but Dyson assure us it has been tested to remove 99.95% of ultra-fine particles, including those of 0.1 microns. I've found it a vaguely terrifying device to use, as opening the door or cooking immediately causes its on-body display to warn of pollution in the air, while the very handy iOS and Android app screen turns red and issues dire warnings about VERY POOR air quality. Of course, it then sets about returning your room (up to 27 sq metres) to a non-poisonous state, so that's nice. It's also a very handy fan, mustering up a decent breeze but remaining quiet up to about the 60% power setting. On higher speeds there is a bit of a whoosh, as you'd imagine. Turning up the speed also increases air purifying power, but there is also an Auto mode that reacts to potent guffs of microparticles and gases. As the app and remote also add scheduling, a quiet and energy-saving night mode, and shows you all manner of graphs about the air quality and temperature, I feel like the Pure Cool does justify its price. There's even adjustable oscillation, via the app. UK based Meaco is best known for its range of excellent dehumidifiers. Well here’s the result of its first attempt at making a bogstandard fan – and it’s bloody brilliant. The Vornado-like MeacoFan comes with 12 fan speeds, an on/off timer and both vertical and horizontal oscillation. In fact you can select the type of oscillation required but I found it works best with both systems on since it effectively bounces the air stream against all the walls, creating a more effective cooling experience. Speed 12 moves 1,056 cubic metres of air per hour but all you need to know is that it feels substantially windy from several feet away. In fact, I was considering launching my powerkite in the lounge until I noticed the wife’s priceless mantlepiece collection. This fan comes with a remote control, too, which is handy if you can’t be arsed to get off the sofa. The remote also lets you adjust the fan’s trajectory so it faces you all the time; simply wait till the air stream moves towards your direction and switch the oscillation off. Or you can get on hands and knees and use the fan’s attractive interface instead. Most fans make quite a din on their highest settings but this one is like a church mouse, even at full tilt, and that makes it the perfect bedroom or lounge buddy. Perhaps it’s the DC motor or the structural design (or both), but this fan produces a much lower frequency when spinning and that makes a massive difference to a room’s ambience. By contrast, most of the other cheaper models on this page sound like industrial hand dryers and while the Dyson Pure Cool has a more pleasing sound, it is also louder at higher power settings. The bods at Meaco have clearly thought this one through and created what is arguably the greatest fan ever invented at a price that is ridiculously cheap. Go forth and buy, like now, while it’s still hot enough to melt the skin off a chicken. A standard fan is only good at circulating the warm air around it. To really cool down you’ll need either a portable air conditioner with a large hot air exhaust pipe leading out of a window, a large bucket of ice or an air cooler like this very efficient model from the house of Honeywell. This machine is capable of reducing interior ambient temperatures by as much as 8˚C. That might not sound like much but even a two or three degree reduction can make a big difference. So how does it work? Warm air is drawn into the unit and passed over a wet honeycomb causing the water to evaporate and lose heat. This cooled, moisturized air is then blown out into the room. Simple innit? The system works best in dryer environments but given its efficient cooling effect, this writer would be happy using one even if living in the Amazon basin (which is what it feels like right now). The CS10XE stands at 80cm and weighs 8.4kg so it’s not an appliance that blends in with the furnishings. That said, it is one of the better looking air coolers on the market and it’s certainly less conspicuous than an ugly portable air conditioner. The CS10XE is capable of cooling an area up to 16m2 and comes with a remote control, an oscillating function, a dust filter and a 10-litre water tank with a low-water alarm. It also works as an ordinary fan. If you have the funds and don’t fancy cluttering up the place with a large portable air-con, then this mighty cooler might just be what the doctor ordered. Note: you can purchase the Vornado and other models from Amazon but word on the street is that it may need an AC converter to use it in the UK. Your best bet is www.poridee.co.uk where they sell the same unit pre-converted for use in the UK. Our hunt for the most powerful standard fan stops here. Vornado is a popular brand in the US and this stumpy floor-standing ‘air circulator’ is one of the company’s most powerful models. In fact, at full tilt it’s powerful enough to feel the airflow from 100 feet away and users report that you don’t even need to be standing in front of it since it circulates the air in the whole room. The Vornado looks like it fell from the wing of an airliner (a very small airliner) and uses a vortex action to move the air in a column of spirals. This air bounces off walls and furnishing to give the effect of a breeze in any part of a room. The Vornado 660 has four different air speeds and is quiet enough on low to add a gentle breeze without disturbance. Being floor or desk mounted is no disadvantage either since you can easily swivel it 90 degrees using the neat chrome glide. No bog standard fan, this. A funky, industrial-style lump of stainless steel , the Q is designed by Swiss artist Carlo Borer – no, okay, me neither – and makes even the Dyson look a little tame. As it only stands 36cm tall, it’s not going to stand out like a sore thumb, however. And even if it did, at least it’s a stylish sore thumb. The Q comes with three wind speeds that are easily changed with a twist of the huge knob on the support leg; output should be good enough for rooms up to 40m2 in size. The removable wire mesh on either side of the blade slightly spoils the aesthetics, but at least it prevents children from having their fingers diced, which is even less aesthetic. It’s not the quietest fan in the neighbourhood when running at full tilt, but at least there’s no assembly required. Just yank it out of the packaging, plug it in and, whoops, there go all your tax return receipts. A doyen of British design, the Dyson Cool Desk has no visible fan blades spinning about. In fact, it looks like an empty circular tunnel with no visible means of blowing any air at all. But it will cool you down in next to no time and not make a racket in the process. Now, are you concentrating? The Dyson uses ‘Air Multiplier’ technology which involves a fast spinning blade faced upwards 90˚ vertical in the base of the unit. Air is drawn in through the base and is forced out through a hidden aerofoil-shaped ramp to create a low-pressure wave behind and around the fan. This change in pressure forces surrounding air to be drawn into the airflow, resulting in a substantial waft of body cooling magnificence. The Cool Desk also features an oscillating function and ten airflow speeds, and it’s all controllable from the sofa using the clever magnetic remote. If aesthetics are of prime concern, then make this one your first port of call. If the Dyson is a financial step too far and the last thing you want is a big ugly pedestal fan, then how about this Dubai skyscraper-style tower option? The Bionaire is 71cm tall and 22cm wide so chances are you’ll easily find a range of suitable places to site it. Decked out in a rather off-putting black and charcoal colour scheme, the BT19 has three speed settings, an oscillating function, a Breeze mode for silent nights, an eight-hour timer and a remote control for added convenience. It’s a fan. It sits on your desk. You turn it on. The blade spins and you feel a bit cooler. If a conventional desktop fan is all you require then this retro-styled offering from Swan is as good a bet as any. Available in nine natty pastel colours, this 12-inch desktop model is described by Swan’s marketing team as having an ‘array of functions’ but, as pretty much expected, this writer could only find, er, three: an oscillating function, three airflow speeds and a tilt function. Perhaps an app-controlled, sensor-filled version is in the pipeline.